Besides that, it came out too cute NOT to share. When Ella first told me what she wanted to dress up as a snowman, I was like "Okay!" Then she told me she wanted a matching costume for "Little Ella", her American Girl Doll and I was like "Oh boy!" Ha!! I knew the doll would be more difficult to find things for so we started with her costume first and then found things for Ella. 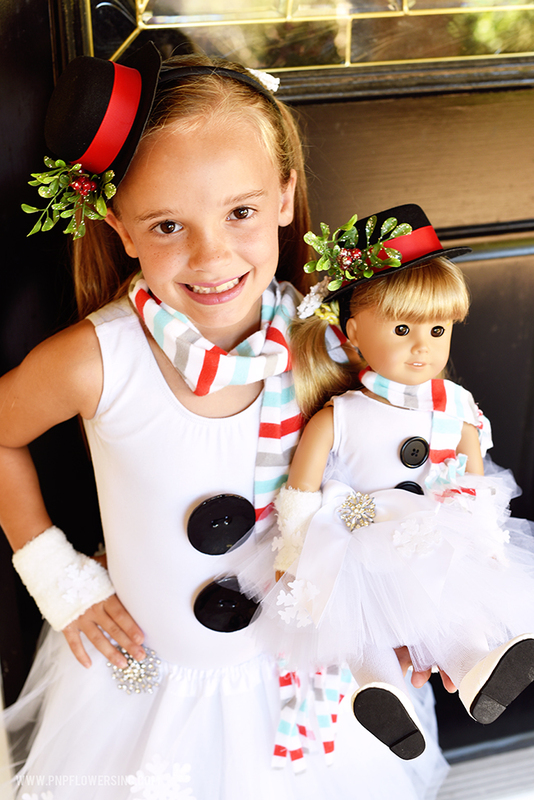 After trying to find some ideas online, we finally decided on a super simple + sweet costume I pieced together from things I found mostly online: tulle skirts, white tights, white shoes, white leotards (with black buttons sewn on the front), matching scarves, white gloves, matching snowman hat headbands and a few snowflake embellishments. We both love how it all came together. I've never seen Ella so excited to wear a costume. I think it had more to do with being able to dress up her American Girl doll - which has become her newest obsession ever since her big sister Clara gave her her old doll a few months ago. Since I don't sew, (aside from being able to re-attach buttons), when it comes to putting together Halloween costumes it either needs to be things I can just piece together or something I can do with a glue gun. Ha! I'll give you all of the specifics at the end of the post. I think it all turned out pretty darn cute! 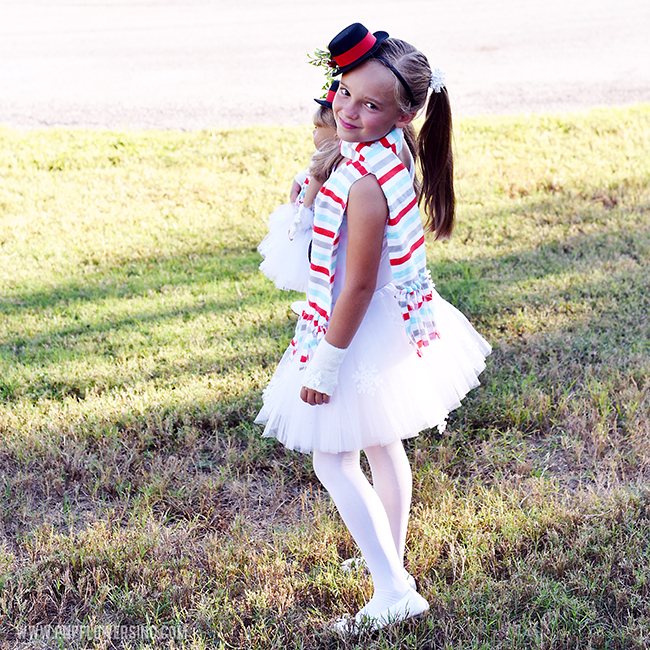 And who knows, maybe you'll be inspired to have your little one dress up like this next year? Scarf - created from fabric found at JoAnn - a little got glue and then knotting the strings on the ends. White Fingerless Gloves - made from a 4pk of baby socks I found at Target - Ha!! Snowflake Hair Ties - made by hot gluing snowflakes I disassembled from a Hobby Lobby ornament. 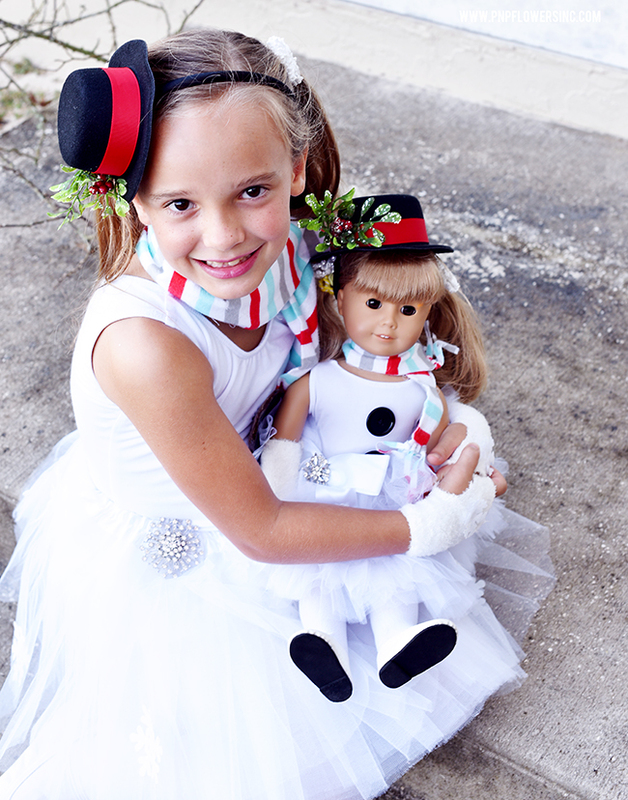 Snowman Hat - I removed the plastic headband attached and replaced with black elastic. White Fingerless Gloves - made from a 4pk of baby socks I found at Target same ones used for Ella! Ella's first idea for a Halloween costume was an ice cube. (no idea where she came up with that one). Even though I'm always up for a creative challenge, I was relieved when she decided on the snowman costume instead. Ha!! But I think it's funny both ideas were related to ice.